When it comes to embracing sustainable and ethical fashion in your own wardrobe, the million dollar question always seems to be – where do I shop? The good news? The answer is closer than you think. The bad news? The options are so good, you might just have a hard time choosing what you like best. Today, I am sharing three places I love to shop for beautiful, unique designs that are made in a way that respects the earth as well as the people who made them. This is one of my very favorites among independent designers. Founder and designer Haley Tucker creates wardrobe workhorses that feel both classic and fresh at the same time. Designed to be mixed and matched together, leaving the wearer feeling effortless and chic. Pieces I like: the Charlie Top and Cove Wide Leg Pants (pictured above in moss) and the Taylor Wide Leg Jumpsuit. Only Child designs, cuts and sews all their garments in house, and is based in Oakland, California. Considered one of the powerhouses of ethical fashion, Elizabeth Suzann has built their brand on unique cuts and artful styles that cater to the slightly avant garde dresser. Many shapes are oversized, while striking and always functional. I bought my first pair of pants a few years ago after Elizabeth Suzann described them as something you could wear to do anything – from working in your garden with rubber shoes to styling with heels and a silk top for a night out. Pieces I like: Clyde Work Pant (pictured in first photo with rust top), Clyde Trench (ivory jacket pictured above), Florence Pant and Petra Crop. Elizabeth Suzann is based in Nashville, Tennessee, where all their garments are designed, cut and assembled in house. Pyne & Smith has made a name for themselves creating classic linen dresses. The timeless dress designs give me old world Europe vibes, but look just as good with combat boots or converse. You can see in the photo above I like to pair my shift dress with pants. I love Pyne & Smith dresses because they are the kind of garments that I can wear year after year, and they will never go out of style. Pieces I like: Model No. 10 Railroad Stripe Linen Dress (pictured with white pants), and Model No. 12 Black Linen Button Up. Pyne & Smith is based in Southern California, where all their dresses are made. Photography by Andrea Hartman and Kiara Rose. Andrea was a panelist at the 2018 Sustainable Fashion Forum. 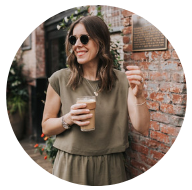 You can find her blogging regularly over at Seasons + Salt.